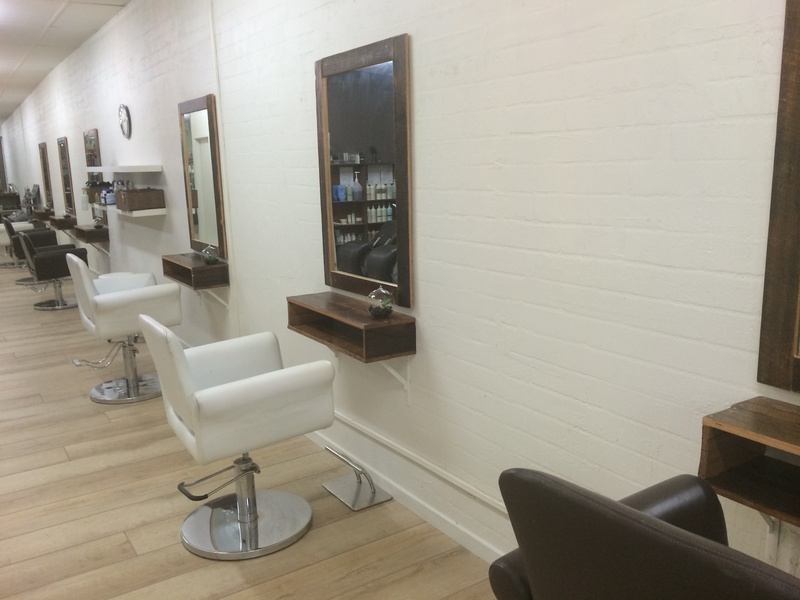 The dust has settled (literally) and now we can reflect upon what a huge undertaking it was to renovate our salon, but we could not be happier with our results. A huge exercise in DIY and utilising sustainable building practices and recycled materials, this team effort was one that after months of planning, preparation, and finally 6 long days of execution, has finally paid off! We thought that we would share some photos and stories about our new home. We started the planning phase months ago. With a goal to be more aligned to the Aveda Mission, it was important for us to make our refit as environmentally friendly as possible. 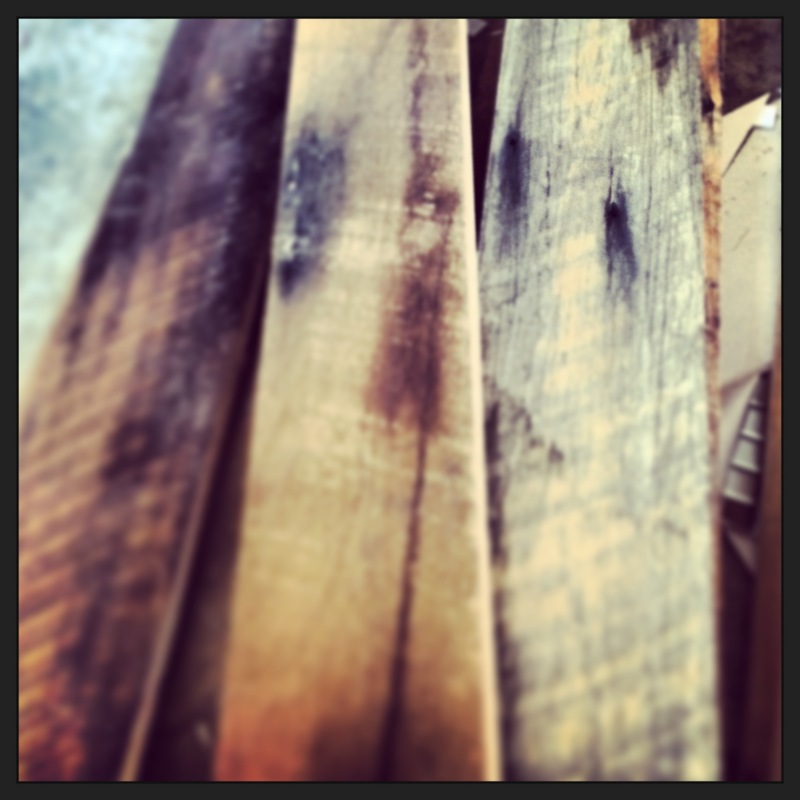 We sourced the timber to build our new workstations and mirrors from Urban Salvage, an amazing supplier who sources and re-mills recycled timber. We loved that the people at Urban Salvage could even go as far to tell us where our timber was sourced from, it is great that every piece has a story. The benches were a fun challenge for our Director Nicole to make, and with the help of April the mirrors were put together too. So we have spoken about what’s attached to the walls, but what about the walls themselves? We started off by using Low VOC (volatile organic compound) paint to minimise the amount of chemicals used. A group of team members, family, friends and whoever else we could rope in did a fantastic job of the painting! We then constructed the feature walls! 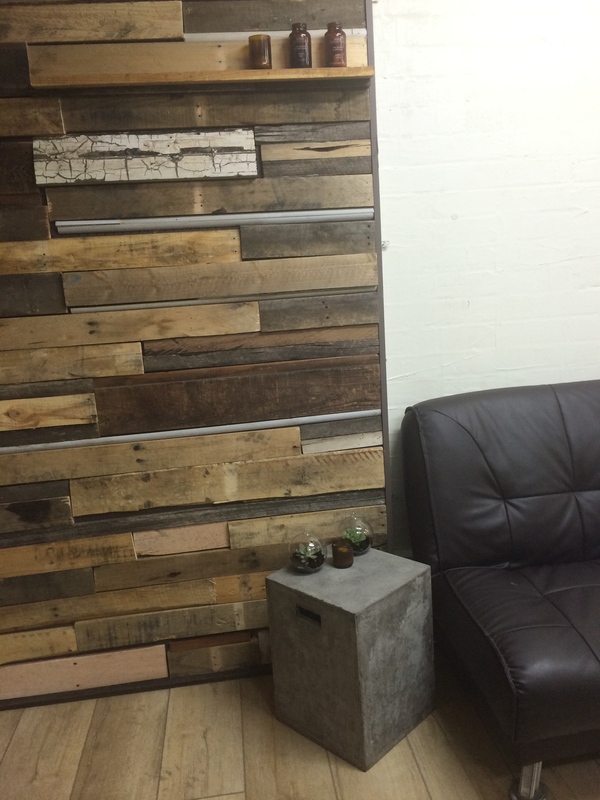 Our feature walls are made out of 100% recycled, reclaimed and salvaged timber. From old weatherboards, reclaimed pallets, and some fence palings and old skirting thrown in there, we loved being able to create our walls and make use of other people’s trash in an artistic way. It was great fun making these, and so far we have had a fantastic response to our mix of textures, colours, and timbers. 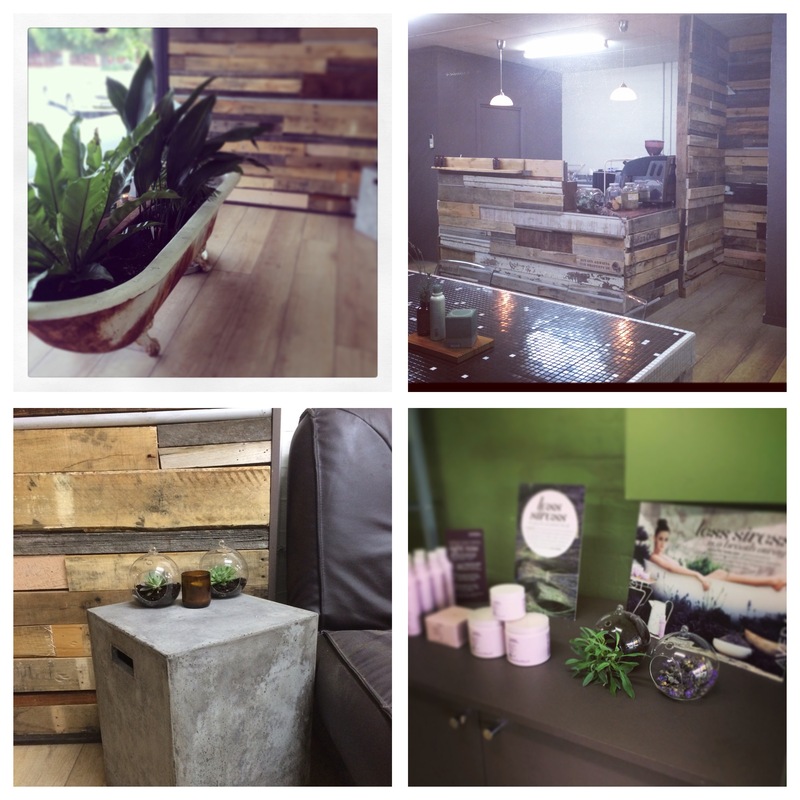 This is a photograph of our front feature wall, which shows off April’s gift to Nicole and the new salon perfectly. It’s a side table crafted from natural hemp and concrete. Perfect! (Thanks again April). We have had many comments from passers-by about our new window display…which is…. A dilapidated antique claw foot bath! An idea of April’s, this beautiful (and heavy!) old bath was sourced from a salvage/junkyard in Melbourne. It’s previous owner had removed it from an old mansion in Hampton in preparation for demolition. It had then been stored on a shed roof for ten years, oxidising away perfectly waiting for us. 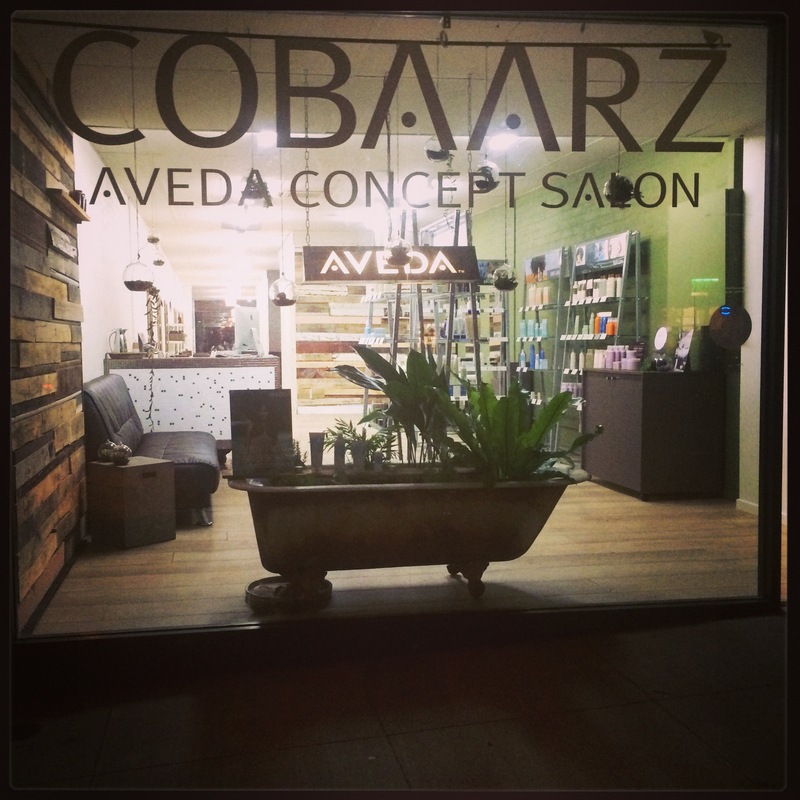 We have planted our bath with Rosemary, Lavender, and a selection of indoor plants to bring some greenery to Cobaarz. We have also hung a large amount of terrariums in the windows, have them on the colour table, and one on each styling station. These terrariums contain succulents and cacti. Each Terrarium works as it’s own little ecosystem, and the moisture inside the bulbs constantly goes between the states of liquid and gas, both nourishing the plant inside and acting as a natural air purification system. Here’s a photo of our front window, with our bath display and some of our terrariums. Before we finish off with some final photos and “makings of”, Nicole has a few words to share about everyone involved in making Cobaarz 2.0 happen. Clockwise from top: Our bath all settled in, Coffee bar area feature wall, launch pad station with raw and living ingredients of Aveda products, and my adorable concrete and hemp side table with terrariums and up cycled Aveda containers. 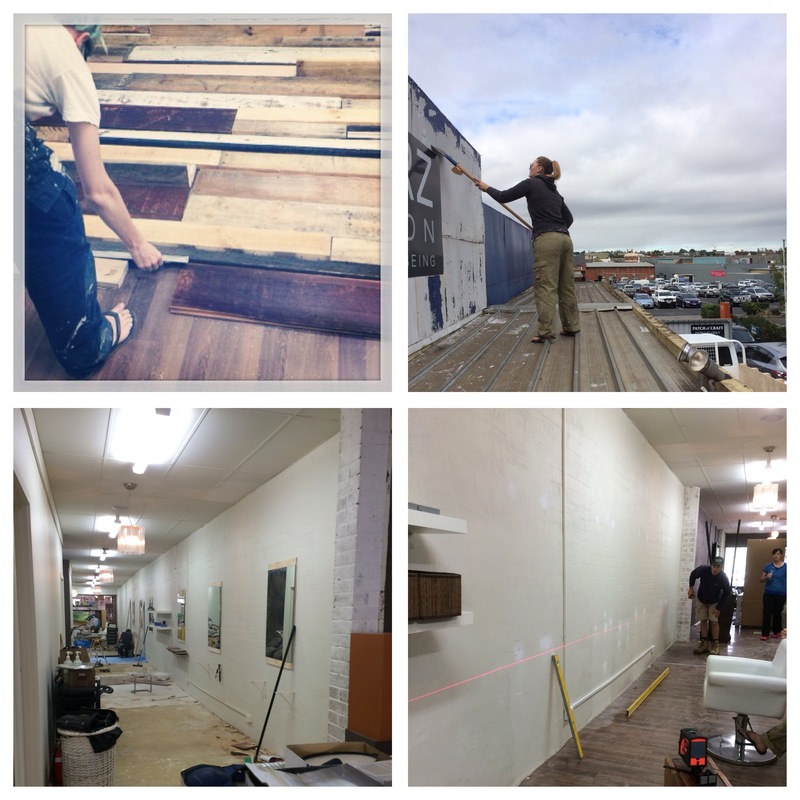 Clockwise from top: Tradie #1 Nicole playing giant jigsaw puzzles to make the feature walls, Tradie #2 April gets stuck into the exterior painting, our builder Joe and “apprentice” (fiancé) Sandra working away, and finally the utter chaos that it was about 3 days before our relaunch! 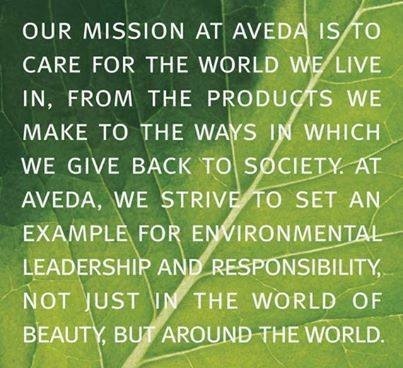 To align with the Aveda Mission, we have committed to making this renovation and refit as eco-friendly as possible. We don’t want to give too much away, but the materials we are using for the benches, mirrors, and decorative features is 100% recycled timber. There’s also going to be lots of greenery, and heaps of other cool additions that we know you will enjoy. It’ll be a completely different salon! In order to complete these works, the salon will be closed on Tuesday 25th, Wednesday 26th, and Thursday 27th of March. We apologise for the interruption, but we promise you will love what we have in store!